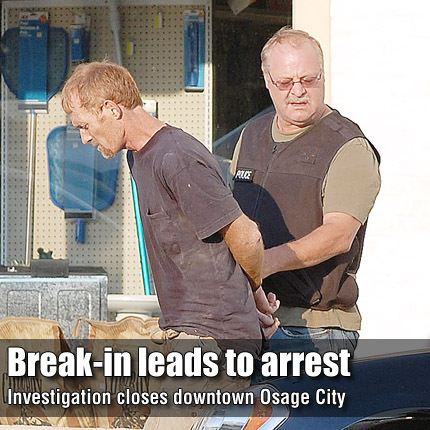 Osage City Police Chief Fred Nech escorts Kelley Beard, 43, Osage City, from a police vehicle for transportation to the Osage County Jail, where he was booked on multiple counts. OSAGE CITY—An early-morning alarm called Osage City police and Osage County Sheriff’s officers to downtown Osage City Friday, Aug. 19. Officers responded to an alarm at Schroeder Drugs, Inc., located at 535 Market St., in Osage City. An employee let officers into the pharmacy, where they encountered Kelley M. Beard, 43, Osage City. “He said he was going to shoot,” said Osage City Police Chief Fred Nech. Officers, who were armed with assault rifles, subdued Beard with the use of a police Taser. He was taken into custody without further incident. At the time of the arrest, Beard was armed with a knife. No other weapons were found on him. Beard had reported two other males were inside the building armed with handguns. A search of the pharmacy and adjacent building, Osage Hardware, by an Osage County Sheriff K-9 unit found no other people inside. Officers cleared several other downtown businesses before ending their search.